The nut that started it all…and they just keep getting better and better. 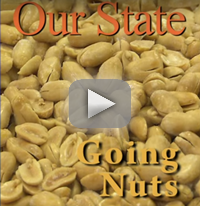 Our Blister-Fried Peanuts are cooked in small 4-pound batches so that we can keep a close eye on their quality. The boiling time, cooking time, and oil temperature are all precisely maintained according to our own recipe, thus guaranteeing you the best tasting peanut you've ever had. 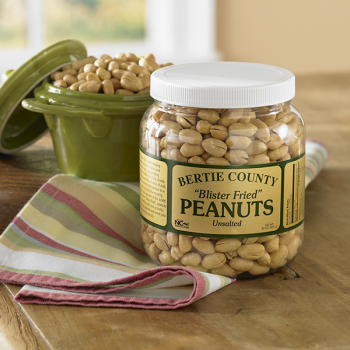 Unsalted and packaged in a tamper-proof recyclable plastic jar with our signature green and gold foil label, these peanuts are a gift everyone is tickled to receive. Used to buy unsalted blister peanuts at Trader Joes - but they stopped stocking them so I went to the internet - and found Bertie - good company/service with great peanuts. Thanks. Best peanuts I ever tasted! Had them at a friend's house last year and have become a continuous customer of your unsalted, blistered peanuts. The unsalted blistered peanuts are the best we ever tasted. I am a peanut lover and these peanuts (unsalted) have a deep, extreme peanut taste. Had them at a friend's house about two years ago and now they are the only peanuts we eat. love the salt free blister fried peanuts! Buy these peanuts. You wont be sorry. They are delicious, large, and crunchy. We purchase them without salt, and still wonderful. I have ordered these numerous times and they are great. My parents and my brothers love them also. Both salted and unsalted are very good. Ordered the blister fried peanuts. Absolutely delicious. I also like that I was able to get unsalted! Ordered arrived very quickly! These are the best peanuts ever! Absolutely do not need salt. They are delicious! These blister fried peanuts don't need salt to pack a punch. They are full of flavor and perfectly crunchy! I AM A LITTLE OF A PEANUT SNOB. ONLY THE BEST AT MY HOUSE, AND THESE ARE THE BEST. I BUY SALTED AND UNSALTED AND MIX THEM. PERFECTION. Our family loves the unsalted blister friend peanuts - less sodium with wonderful flavor. They're also our go - to for an easy gift for friends. Thanks for a great product! The chocolate bar is still the best I have tasted. The unsalted peanuts are great. I had to switch to unsalted and I am not disappointed! I prefer my blister peanuts unsalted, but most roasters just barely roast them leaving them rather pale and flavorless. Bertie's are roasted to a nice golden brown giving them a full peanut flavor. Taste good, as often, good things are expensive. The chocolate continues to be the best I have eaten!! The peanuts (unsalted, blistered) taste stale and not as crisp as before. The nuts were very good. In fact they're so good we plan to order more soon. 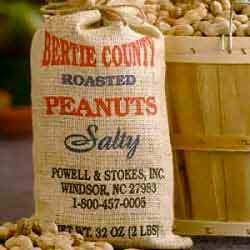 We are very pleased with the service and products we receive form Bertie County Peanuts. Our order shipped unbelievably fast, everything was in perfect condition and the jar we opened to sample has disappeared rather quickly. I can count on your peanuts being to grade and cooked to perfection!